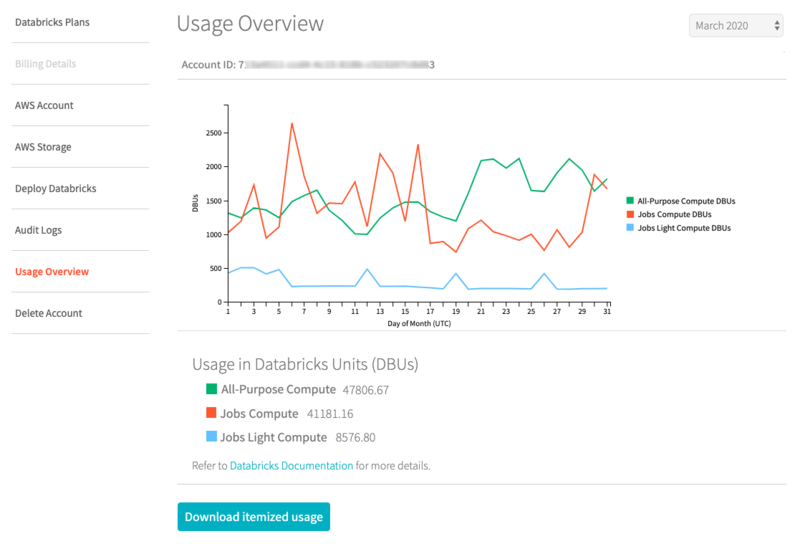 The Account Console is where you administer your Databricks account-level configurations. Only the account owner who initially created the Databricks account can log in to the Account Console. Click the user profile icon at the top right and select Manage Account. In the Account Console, click the Billing Details tab to view and configure billing details for your account. In the Account Console, click the AWS Account tab to configure AWS access from Databricks. In the Account Console, click the AWS Storage tab to configure AWS storage settings for your account. In the Account Console, click the Audit Logs tab to configure audit logs for your account. In the Account Console, click the Deploy Databricks and Delete Account tabs to manage your Databricks account. In the Account Console, click the View Usage tab to see historical account usage.